Ten-man Fylde suffered late heartbreak as they slipped to their first defeat of 2016. Worcester took the lead after just six minutes through Amadou Bakayoko before Josh Langley was controversially shown a straight red card for lashing out at James Smith. Danny Nti converted the resulting penalty to put the visitors into the driving seat only for depleted Fylde to draw level through Dion Charles and Danny Rowe. However, there was to be a final twist as Nti grabbed his second seven minutes from time to condemn Dave Challinor’s brave troops to defeat. Challinor made just one change to the side that had beaten Eastbourne Borough in the FA Trophy the previousweekend, with Ben Hinchliffe replacing Matt Urwin in goal. The lively visitors took the lead with the first opportunity of the match. Nti’s strike was spilled by Hinchliffe and Bakayoko was on hand to turn home into an empty goal. The home side were almost back on level terms five minutes later, when Rowe’s clever flick from Richie Baker’s corner went just the wrong side of the post. After a slow start, the Coasters began to grow into the match and Charles fired well over the bar from the edge of the box. Things went from bad to worse on 19 minutes, however, when Langley was dismissed after a fracas with Smith. To rub salt in Fylde’s wound, Worcester were awarded a penalty which was duly dispatched by Nti. Sam Finley looked to find a way back into the game but scuffed his effort after a mazy run. Fylde did have the ball in the net on 27 minutes but Charles’ close-range strike, after the keeper had fumbled Rowe’s curler, was ruled offside despite replay’s suggesting otherwise. The visitors looked to add to their tally when Sam Minihan’s cross was headed narrowly over by the well-placed Bakayoko. The Coasters pulled one back shortly after the half-hour and it was a goal of real quality. Neat interplay between Caspar Hughes and Charles resulted in the winger smashing a shot across goal and into the bottom corner from the edge of the box. After a lull in play, Worcester midfielder Danny Jackman was allowed to race towards the Fylde goal unopposed and his low strike was palmed around the post by Hinchliffe as it remained 2-1 at half-time. Fylde began the second-half in the ascendancy and pressed for an equaliser – Finley seeing his powerful shot deflected narrowly over. The Coasters almost went ahead and with a carbon copy of their second goal. Lloyd’s corner was again met by the head of Rowe but this time the ball was deflected around a post. Charles almost found a way through on 62 minutes as he stumbled past several defenders before seeing his goalbound shot blocked. Worcester hit back with a rare sight of goal but George Cleet’s long-range piledriver was just over. Another Fylde corner brought a chance as Tom Hannigan’s looping header was cleared off the line. Substitute Wade Thomas gave Fylde a scare with 15 minutes to go, launching a rocket from fully 35 yards that was claimed by Hinchliffe at the second attempt. There was so nearly a decisive third for the home side when Rowe’s strike was deflected into the path of Baker, who cut the ball back but Charles couldn’t quite turn it home from six yards. 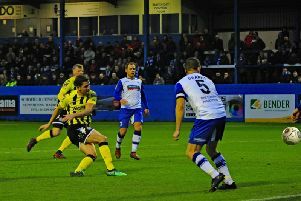 Fylde continued to knock on the door and a dangerous ball across the goal from Hughes was missed by everyone in the box. However, there was to be a cruel twist eight minutes from timem when Nti found himself with space in the box and found the top corner with aplomb for the visitors. Charles was agonisingly close as the hosts pushed for another equaliser but the visitors held on. Manager Dave Challinor branded the refereeing “unacceptable” but admitted his Fylde side had contributed to their own downfall against Worcester. The Fylde boss said: “It’s disappointing because even with 10 men we dominated. “We gave ourselves a mountain to climb early on, but managed to get back into it and ultimately we didn’t get what we deserved. “The result was taken away from us by a refereeing performance that was unacceptable. I’m the last person to have a pop at referees but the decision-making wasn’t good enough. “We played a part in our own downfall. Josh Langley shouldn’t have got involved but he should have never been put in that position. “Their lad goes straight through the back of him with a ridiculous challenge. “Josh will get a three-match ban but their player should be looking at that at least. “Emotions are always running high after a game like that, so we will assess things over the next few days and decide what to do. We had a few great chances to win the game and Dion (Charles) had a goal disallowed that was clearly onside. AFC Fylde: Hinchliffe, C. Hughes, Hannigan, Langley, Crainey, Wilson (Barnes 35), Finley, Baker, Charles, Lloyd (M. Hughes 75), Rowe. Subs not used: Urwin, Whittle, Blinkhorn.